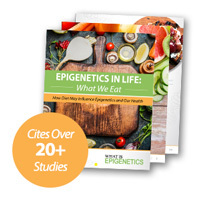 The Epigenetic Benefits of Your Thanksgiving Feast | What is Epigenetics? Thanksgiving is a time for people to come together to share what they are thankful for, enjoy each other’s company and, perhaps most importantly, eat. Sharing a large feast is a great way to strengthen the bond between family and friends during Thanksgiving, but you might not know it’s an opportunity to make the best of the nutriepigenetic benefits of your food. Nutriepigenomics looks at the effects different types of food and various nutrients have on the human body via epigenetic modifications. Little do you know that passing up the broccoli for a second helping of those candied yams this Thanksgiving may do more than just increase your waistline- it might actually affect your epigenome! Certain dietary choices you make during Thanksgiving may have the potential to change the epigenetic marks on your genome associated with disease risk and well-being. The Thanksgiving dinner buffet is often full of fattening treats like buttery turnips, candied yams (with marshmallows on top, of course), and sweet cranberry sauce – not to mention the overflow of pies when it’s dessert time. Some healthier side dish options during dinner, however, like that bowl of untouched brussels sprouts or freshly steamed broccoli might epigenetically lower your risk of cancer, maybe even preventing tumor growth. Research shows that there are natural chemopreventative nutrients, such as micronutrients folate and retinoic acid as well as dietary compounds from cruciferous vegetables like broccoli or cauliflower that help to counteract the epigenetic effects that can lead to cancer. To fight against these epigenetic alterations, evidence shows that these chemopreventative agents influence expression or activity of DNA methyltransferases and histone modifying enzymes. Although much of this research has been done in vitro on cultured cancer cells, these effects have been shown in various preclinical and clinical studies. In a clinical trial, dietary compounds such as diallyl disulfide, which is found in garlic, and sulforaphane, which is found in cruciferous vegetables, were linked to cancer prevention. According to the research, these dietary compounds were shown to inhibit type I and II HDAC enzymes. These compounds act similarly to other HDAC inhibitors by inhibiting cell proliferation and stimulating apoptosis, crucial to prevent the spread of cancerous cells. Maybe now that heaping bowl of broccoli will actually look appetizing this Thanksgiving. Seconds, anyone? If your Thanksgiving dinner buffet includes fish or any foods such as nuts, seeds, or leafy vegetables that contain DHA (one of the major omega-3 fatty acids) it may be a good idea to make some room on your plate. A study showed that adding DHA extracted from fish oil to neuroblastoma cells resulted in an increase in Bcl-2 levels, which reduced neuronal cell death, and an increase in acetylation of H3, which the researchers predict may correct altered acetylation homeostasis and potentially induce the expression of neuroprotective genes. Results also indicated a decrease in methylation, deacetylation, and phosphorylation of H3 and caspase-3 levels. Food containing this compound seems to affect gene expression and has potential neuroprotective benefits that could even help those suffering from a neurodegenerative disease. If the Thanksgiving buffet this year doesn’t already include fish such as salmon or other sources of omega-3 fatty acids, considering adding these items to the menu or bringing over a dish this year – it may help promote healthy neurons and protect against neurodegenerative diseases. Instead of that liqueur or coffee to soothe your inevitably bloated stomach, consider sipping on some green tea after your Thanksgiving feast. There is evidence that a major polyphenol found in green tea, known as Epigallocatechin gallate (EGCG), may epigenetically affect immune system functioning. EGCG in green tea has been shown to act as a DNMT inhibitor, according to a recent study. The researchers found that treating cells with this green tea polyphenol induced Foxp3 expression in Jurkat T cells, which was associated with decreased DNMT expression and DNA demethylation. Mice treated with EGCG in vivo displayed increased regulatory T cells, which are crucial to proper immune function, including immune tolerance and autoimmune suppression. Other tea polyphenols such as catechin and epicatechin have also been shown to affect DNA methylation in a similar manner. So don’t head home early and pass up that cup of tea after Thanksgiving this year, as it may actually epigenetically promote proper immune function (and just in time for flu season)! *Disclaimer: The points made herein represent a speculative opinion of the author based on related scholarly publications on animal and human studies. Gerhauser, C. (2012). Cancer Chemoprevention and Nutri-Epigenetics: State of the Art and Future Challenges. Natural Products in Cancer Prevention and Therapy. 329: 73-132. Davis CD, Ross SA. (2007). Dietary components impact histone modifications and cancer risk. Nutr Rev. 65(2): 88-94. Sadli, N. et al. (2012). Effects of zinc and DHA on the epigenetic regulation of human neuronal cells. Cell Physiol Biochem. 29(1-2): 87-98. Wong, et al. (2011). Induction of regulatory T cells by green tea polyphenol EGCG. Immunol Lett. 139(0): 7-13.